The basis for this particular memoir began as a search for a natural spring in Bukit Gombak in February 2005. We were told that many car owners and taxi drivers chose to wash their cars with water from an ever-flowing drain on the roadside. Now before you feel all disgusted with the notion of using filthy water from a drain, I assure you that the water doesn't come from some waste or sewage outlet. In fact, I was told that the water came from a natural spring located up in the hill, bestowing good luck upon those who came into contact with it. Many 4D lottery winners claim to have winning numbers derived from their car plate numbers after washing their cars with the water from this spring. We absolutely had to find the source of this spring and see the real deal for ourselves. 3 separate visits to the area were made, a first visit was made in 2005 in a bid to locate the spring, a follow up visit in 2007 to re-document a startling discovery and a third visit in 2011 to search for more clues together with our friends from the T.O.S.S. Left: The water flow was practically non-existent during our second visit. Right: Some amount of effort is required while tracing the drain uphill. During our maiden trip, we traced the drain up a steep slope and walked along the drain, which led us into some light vegetation until we met with a green wire fence. Behind that fence was the abandoned Seng Chew quarry, and we were disappointed to find out that the trail has ended abruptly at this fence. The water flowing down the drain had actually come from the overflow in the quarry lake itself. A former granite pit, the Seng Chew Quarry was one of many abandoned quarries in the area which had filled up over the years with rainwater, former a beautiful lake. This probably explained why the water flow in the drain was inconsistent as it depended very much on precipitation. The wetter months probably meant that the lake would overflow, leading to the excess water being extruded down the drain. This was evident on our second visit, a hot and dry month with little rainfall, the drain was pretty much dried up. As we traced the drain back out to the side of the hill , we noticed a sinister looking structure peeking out from the foliage. Excited at our discovery, we searched around for a suitable entryway before deciding on a path where the shrubs looked trampled. Avoiding overhanging branches and the occasional hidden pothole, the beaten path soon led us to the top part of the structure, the flat roof strewn with dead leaves and fallen branches. By now we could make it out to be an old concrete structure which looked like some sort of shelter. There was a little dirt path beside the structure and we descended the slope, holding on to the side of the structure for support, eager to find out what was underneath. As we descended the slope, we were appalled at what we found. The shelter's current purpose is slowly revealed to us as we descended the slope. The shelter turned out to be a shrine, decorated with tables draped with yellow cloth, as well as a couple of small cabinets holding joss sticks of various sizes. Further inside the shelter, an altar - partially filled with earth - was decorated with yet more yellow cloth, some of which were half buried and 2 uncanny-looking black rods with faces drawn upon their tips hammered into the soil. The altar didn't look like any ordinary Taoist altar, although the offerings suggested that the worshipers here would be mainly Taoists. Yellow candles were burning brightly along with a single, large joss stick emitting a sweet sandalwood fragrance. Someone - probably a caretaker - had been here just minutes ago, although this person was now gone. That was pretty strange as we did not see anyone in the area just before we entered the beaten track leading to the shrine. It was a pity as I'm pretty sure this caretaker would have been able to shed some light on this mysterious place Within the confines of the shelter, there was also an altar set up for the Earth God (土地公), a Chinese deity similar to the Datuk Gong, a similar offering of a joss stick burning away, enhancing the alluring fragrance in the air. From our understanding, we believe that the altar had been set up to worship the Datuk Gong (拿督公 or Na Du Gong in Mandarin), a Sino-Malay deity found in Singapore, Malaysia and some parts of Indonesia. It is said that the Datuk Gong is a local guardian of sorts, and is often consecrated in objects such as trees, rocks and even inanimate objects such as walking canes and weapons such as the keris (malay dagger). In that aspect, the black rods could have been an iconographic representation of the local Datuk Gong of this area. Other indications of Datuk Gong worship at the altar included the usage of yellow candles instead of the usual red candles in Taoist worship, and the presence of yellow cloth around the shrine and altar. These 2 practices are used almost exclusively for Datuk Gong worship. Not to be confused with the Malay Datuk Keramat, the Datuk Gong is a localized Chinese folk religion first brought into Malaya by early Chinese traders. The Malay belief in keramat worship (saint worship) was partially adopted by the Chinese, with the elements of Keramat worship which were similar to Chinese folk religion or useful in helping them adjust to the new environment in Malaya. It is also believed that the practice of Datuk Gong worship grew out of the needs of the Chinese to socialize with the Malay state and society and the strong Chinese belief in the worship of ancestors and holy spirits. On the altar, there was also a Kemanyan dish, a special concave dish made of clay and used to hold and burn kemanyan incense. Kemanyan (Styrax Benzoin - see pic on left - also known as Gum Benjamin) is a common incense used throughout South East Asia for cleansing and blessing homes. Made from a resin collected in the same manner as rubber sap, Kemanyan is also believed to be favoured by the Datuk Gong and is normally burned at their altars alongside regular offerings such as joss sticks and candles. In most rituals concerning the Datuk Gong, kemanyan is always burnt to produce a lot of smoke beforehand. Mediums channeling the Datuk Gong would also breathe in copious amounts of kemanyan smoke while in a trance. 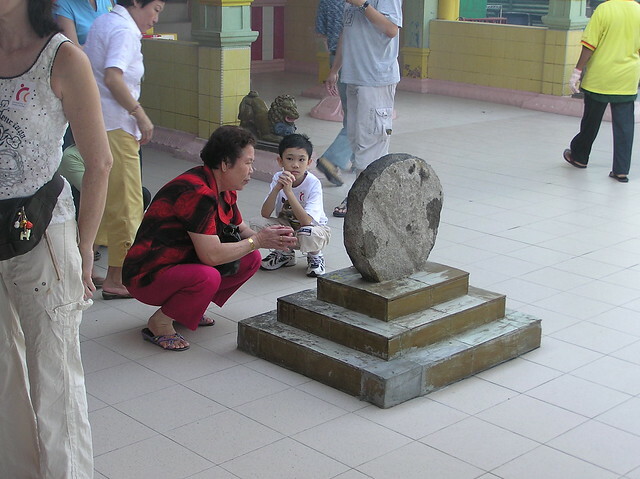 One good example of the use of kemanyan in Datuk Gong worship would be the famous "Datuk Loyang Oracle Stone" in the Loyang Tua Pek Kong temple (yet another similar deity to the Datuk Gong). Kemanyan incense is offered daily in a kemanyan dish to the Datuk Gong of the temple and placed at the "Oracle Stone" in front of the altar. Devotees would then try to derive numbers from the whirls of smoke emitted from the burning incense, contrasted against the grainy, round stone. While the shelter and the altar within was of much intrigue to us, we had 2 important questions in our minds. Why was this shelter here, and why is there a need to set up an altar to worship the Datuk Gong in this shelter? Let us take a look at the history of the area and to understand what Bukit Gombak used to be before it became a residential area. To many people, Bukit Gombak is well known for the picturesque granite walls and tranquil lake of Little Guilin (小桂林), but it wasn't too long ago that this scenic park was still a thriving granite quarry. Known back then as the Gammon Quarry, Little Guilin was but one of many quarries established along Jalan Perang (present day Bukit Batok West Avenue 5), which included the Seng Chew and Lian Hua Quarries as well , the abundance of natural granite in the area being a lucrative source of income for enterprising businessmen. Before Bukit Batok New Town existed, the Gammon Quarry and Seng Chew Quarry was only accessible from a long track leading in from Upper Bukit Timah Road. As quarrying was a dangerous activity which involved blasting of the granite walls to break them down into smaller pieces, the quarries were located far away from the main road and the general public to prevent mishaps. However, with these measures in place, accidents were still commonplace as there were people living in small villages along the Jalan Perang area. Newspapers often carried reports of people killed by flying rocks or debris near the quarries. In the Nineties, quarrying activities in Bukit Gombak had to be stopped as the granite had been mined below sea level, threatening the ecology of the area. The Government had also successfully negotiated to buy granite from Indonesia, with a new source from the Karimun region. Hence, these quarries around the Bukit Gombak area were eventually closed down and abandoned. Years of rainwater slowly filled up the quarries and natural vegetation slowly recovered around the edges, , turning them into the scenic lakes we see today. Trivia: Granite quarries played an important part in the construction of many of Singapore's iconic buildings. The Horsburgh and Raffles Lighthouses, as well as a substantial part of the Causeway, were made using granite supplied from the Pulau Ubin quarries. As for the quarries in Bukit Gombak, much of the granite mined from these quarries was used to build countless HDB flats. Jalan Perang, a small lane near to the Seng Chew quarry and our structure in question, was also home to a temple right up until the mid Eighties.Whether this temple was once home to a resident Datuk Gong of it's own, is a big question mark for now though. With the structure's close proximity to the quarry, Christopher "Krisgage" Lee - our resident WWII specialist - suggested that it could be a blast shelter used during the prime of Seng Chew Quarry's halcyon days. Blast shelters were a common sight in quarries, their thick walls providing the workers cover when detonation was taking place. The shelter was also a convenient area to house a shrine since it safeguarded the altars from rain or shine. However, we are unsure as to whether the shrine was already present when the quarry was in operation, or consecrated after the quarry was abandoned. We do understand that the Chinese are extremely superstitious when it comes to mining and earth moving activities, hence it would be quite possible if the Datuk Gong was worshiped from the very beginning for the well being and protection of the workers on site. When we went back to the shelter on our 2nd visit in 2007, we were shocked to discover that the shelter had collapsed into a heap of rubble. Had it been demolished on purpose, or did it succumb to the rigours of Singapore's harsh weather? Moreever, as it was located on a slope, did soil erosion cause it to crumble? We had to find out more, and we quickly found ourselves bashing into the vegetation, following the same path which was now overgrown with underbrush, and soon arriving back at where the top part of the structure once stood. Upon closer inspection, we found out that some parts of the structure were still standing. There were signs of the structure's roof giving way and caving in, causing a domino effect on the other parts of the shelter.Looking at the extent of the damage, I feel that the shelter must have caused a fair bit of clatter when it collapsed. I hope no one was inside or nearby the shelter when this ordeal happened. As I was looking around the structure, Andrew climbed on top of the fallen structure and tried his best to get a shot of the interior. There wasn't anything much left except for the heap of rubble, I guess everything had been pretty much wiped out during the structure's collapse. Lying docile nearby the structure, a fallen tree bore a soiled yellow sash binded around it's trunk. Such trees are a common sight near shrines, the yellow sash acting as a marker for a holy site and one can normally find offerings around the tree or nearby. The same tree in 2011. The sash is now faded due to the unforgiving weather. When we first visited the shrine in 2005, our spiritual advisor, Christopher Soon (not to be confused with our WWII specialist, Christopher "Krisgage" Lee), an ardent practitioner of the art of Reiki, managed to sense strong vibrations emitting from a tree that was adorned with a yellow sash as well. I believe this might be the same tree that Chris had "communicated" with in the past. In close proximity to the collapsed shelter, we found a framed picture with some joss offerings and a kemanyan dish nestled in front of a peculiar large rock. Upon closer inspection, the picture in the frame had been defaced by water. Andrew, ever ready to find out more about the deity being worshipped in the picture, managed to find an exact matching picture of what the defaced picture once looked like. It turned out to be a picture of Mahakali, an aspect of the Hindu goddess, Kali, and often revered as the Divine Mother by devout Hindus. While it was an interesting find, it is not uncommon to find altars or shrines of deities from different faiths concentrated in or around the same area. Whether this was because of the belief of the area being an extremely holy place, or rather for the convenience of the worshipers, is something that probably only the ones who set up the shrines could answer. Nevertheless, Taoist devotees are known to worship Hindu deities, and vice versa. 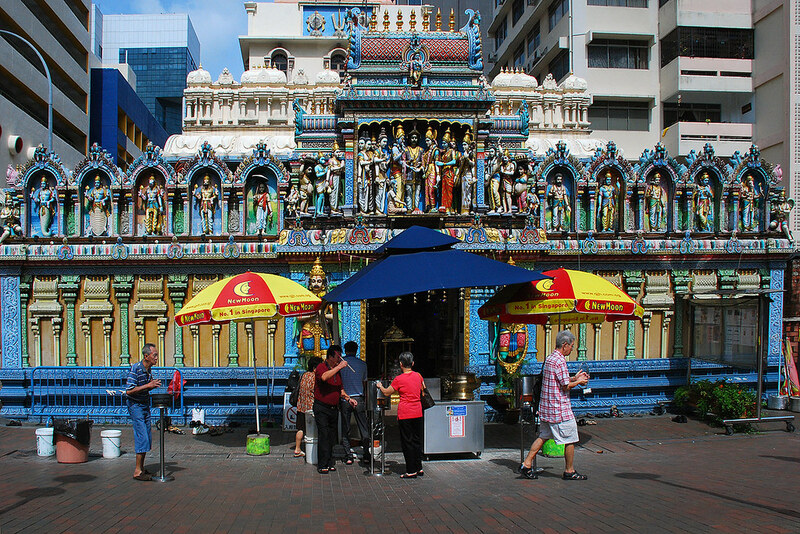 This is evident in both the Loyang Tua Pek Kong Temple, where 3 religious faiths can be found under the same roof, as well as the Sri Krishna Hindu Temple along Waterloo Street where Chinese Taoists can often be seen offering joss sticks and Kemanyan to the resident deity, Sri Krishna. When our team returned to the area for a third visit in 2011, the rock was still there but the picture and the joss stick stubs had been removed. We found remnants of the kemanyan dish, broken and left behind. The rock had also gathered some moss over the last few years, lending it a greenish appearance now. "It was going to be my second visit since 2007 with Aaron, knowing that the structure which had housed a makeshift shrine had already collapsed. I wondered if it would still be in the same state as it was - crumbled and abandoned. I was unfortunate not to be have seen the structure in it's original form when Aaron and two other members had visited it in 2005. Going up the slope, we walked along a long the drain prior to our arrival at the location. This time round, it was easier to access the location than it was in 2007, where i had to take a longer and more difficult route through jungle vegetation. Near the fence of the quarry lake, the hill slope was gentler and cleared of vegetation , apparent evidence that people who had erected the shrine up there, were still visiting this location. Thankfully it hadn't rained the day before, therefore the bare slope wasn't muddy and we were aided with our climb upwards with the help of jutting rocks acting as footholds. As soon as we were level with the fallen structure, we saw 3 young tree saplings planted with encircled stones in a clearing. All of us took extra care not to trample on them accidentally. We had to climb upwards for a little while more before we reached the ruins proper. Nothing much was left as most of the structure had been reduced to bits by weathering and the collapse, which was likely to have been caused by a falling tree, or trees. There were leftover remnants such as nails, metal struts, railings and pipes (possibly from the original structure) as well as praying materials leftover from the makeshift shrine (eg. a cloth that was used to wrap around a sacred tree). We scoured the ground for any evidence that might show the original purpose of the structure. Was it a former WW2 structure built by the British or Japanese? Or was it a former British Bofor guns encampment? We found out throught research, that there were various such placements around the Bukit Timah and Gombak area with the former RAF Gombak base just on the other side of the hill. We made no fruitful discoveries apart from finding an odd brick or two and a small fruit / vegetable garden complete with banana trees. There was, however an odd bricked structure facing the pond area, which had no visible entry way or window slits. It had a tree growing out from the top of it, bottom part of the bricked structure, the underneath was hollowed out by somebody. It didn't provide any clues either. Further research online shows that the area was a former quarry. There were at least 4 other quarries in the area of Bukit Gombak and Bukit Timah." In line with the use of the area as a granite quarrry, could Krisgage be spot with his theory of the structure being a blast shelter? How about you? What do you think? Or perhaps you know more about the practices of Datuk Gong worship and/or the presence of other similar hidden shrines which you'd like to share? We'd love to hear from you! This is awesome work guys! Hi, I've been exploring interesting places in Singapore and has visited Seng Chew Quarry. But I did not see structure that you have mentioned. Will try again the next round. Would also like to know if the Marsiling Tunnel is still accessible. Please share more of your future expeditions! My email is dna_jeremy@yahoo.com.sg.